The biggest and most notable change is the aggression. Sections of ‘Robotic Wasteland II’ are truly brutal, fist-pumping and gravel-coated pieces of anger. Every single part of this fantastic piece of work emanates hatred and snarls; it’s something that really needs to be experienced. 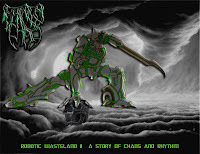 And if just one of the angriest pieces in the history of chipthrash wasn’t enough, the release is rounded up by remix by Pxl-Bot co-owner Andrew Kilpatrick and more from Pxl-Bot buddies Starpilot and The MM Project bringing the track count to 13!! Spooky? You’re Halloween is going to be a brutal one.